Materials Engineering & Testing Corporation (ME&T) provides a wide variety of technical services. Our specialties are: chemistry of metals/alloys; chemistry of reactor control-rod materials; metallography/ceramatography; failure analyses; mechanical testing; and non-destructive testing. Our sister company, Materials Fabrication and Testing Services (MF&TS), offers a full line of fabrication services. For 35+ years, our staff has provided customers with data that meets or exceeds their requirements. ME&T meets the requirements of 17025:2005, 10CFR50 Appendix B and NQA-1. 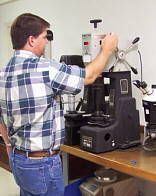 Our metallurgists, materials engineers, chemists, inspectors, engineers, and certified technicians use computerized, state of the art equipment/instrumentation to evaluate your samples.